The Sentence “Where You At?” Is An Example Of A? Prior To The Advent Of Petrol-based Lubricants What Was The Best Lubricant Available? Zero copulas are an interesting linguistic phenomenon wherein the subject and the predicate are joined without a copula—a verb or verb-like word that links the two together. In sentences like “The sky is blue” or “The bus is gone”, the verb “is” functions as a copula linking the two parts of the sentence together. If your only language is English, you may be struggling to think of a copula that isn’t some form of “to be”, like “is”, “was”, “were”, and other variations—don’t worry, you’re struggling for a reason since English doesn’t have any other copula words. The absence of a copula in a sentence where it would otherwise be prescribed by the grammatical rules of a given language is known as a “zero copula” and is found, in some fashion, in a wide variety of languages including Japanese, Russian, Hungarian, Hebrew, Arabic, Hawaiian, American Sign Language, and some varieties of Caribbean creole languages as well as African-American Vernacular English (AAVE). Within the context of a given language, the use of a zero copula is always governed by the ability of the listener to understand the context clearly without the copula as well as language specific grammatical rules. In Russian, for example, you can drop the copula in the present tense but not the past tense, thus a sentence that would translate to “He is now at work.” could be shortened to just “He at work.” with no loss of meaning. In African-American Vernacular English, likewise, the copula can be dropped if using the present tense, the meaning is clear, and if the copula could have been contracted in Standard American English. 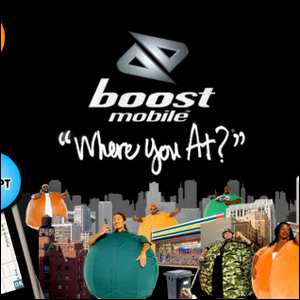 In the case of the sentence found in today’s trivia question, both as an example of a zero copula in AAVE and as the catchphrase from the popular mid-2000s Boost Mobile phone ads, “Where you at?” is a zero copula because “are” is dropped from “Where are you at?” and only works because “where are” can be contracted to “where’re”.